Because they are often ignored in the average woman’s skin treatment and beauty regime, hands down, our hands give our age away before our faces do. No woman wants to betray her true age with a simple hand shake or casual gesture, which is why hand rejuvenation has become a popular way to wage the ongoing war against aging! Hands are exposed to the environment and the sun every day, causing the skin on the skin back of the hands to become thinner and age more quickly than other parts of the body. Whether you have wrinkles, age and brown spots, dry and rough skin or “transparent” thin skin and bulging veins, these can all be corrected through the appropriate treatment. Luckily, there are several skin treatments used to rejuvenate hands and restore the youthful color and contour we once had. Typically considered to be facial skin treatments, procedures like laser treatments, chemical peels, microdermabrasion, and even filler contouring can help to restore the look of youth and elegance in our hands, too. Dr. Wright has assembled a comprehensive range of different treatments available to treat the aging appearance of your hands. At SKIN MD and Beyond there are many options to choose from, and in your consultation, we will discuss your expectations in order to determine which combination of treatments will deliver the results you want. At Skin MD and beyond we offer topical therapies such as the sun protection, wrinkle reduction and pigment protectors to treat the skin of ageing hands! Prevention of hand aging changes includes the use of a good sun block and sun protection such as wearing gloves. If you are out in the sun working in the garden or other activity for which you will have long sun exposure these preventative measures can make a difference. In addition, there are many preventative measures that you use on your face that can easily be used on the hands including, topical Retin-A, Co-Q 10 and vitamin C. These preventative measures can make future IPL or photo rejuvenation treatments unnecessary. For those who did not begin prevention earlier enough, Dr. Wright will create a customized Hand Rejuvenation Skin Care Program for your daily home regimen consisting of medical-grade skin care products to optimize treatment effects and maintain good results. Programs are customized for each patient to ensure they are using the best products for their individual skin care needs. Prescription Medications may also be prescribed by Dr. Wright in conjunction with your Comprehensive Hand Rejuvenation Treatment as part of our multifaceted approach to maximize results in a short period of time. Prescription-strength skin care like Retin-A and other creams are proven to significantly reduce the aging process. Topical applications can repair sun damaged skin, make age spots to fade, improve skin texture and stimulate the production of collagen. To learn more about our Skin Care Product click here. Microdermabrasion is a superficial type of treatment using very fine crystals of aluminum oxide to remove the dead outer layer of the skin resulting in a smoother skin surface. DermaSweep Treatments are similar to microdermabrasion, except that, instead of using crystals to exfoliate the skin, we use customized brushes of varying intensities. Both procedures take 30 minutes and patients can immediately return to regular activity. Only the surface cells of the skin are removed, so no additional wound is created. Microdermabrasion is a technique can be helpful with fine skin texture and pigmentation. Generally, more than 12 treatments are required and the results are usually slight, and certainly a lot less dramatic than the other treatments mentioned above. Chemical Peels are available in a variety of forms that can be used to produce a separation and peeling of the outer layers of the skin. The new skin beneath is smooth and practically blemish-free, with reduced fine lines, wrinkles, spots and sun damage. Dr. Wright prefers to treat the hand with a series of six or more mild chemical peels spaced at two to four week intervals. Glycolic acid and beta hydroxyacids work well for fading mild cases. In some cases stronger peels are needed for more stubborn cases and pose little risk of scarring or permanent discoloration (which are risks when alternative medium strength peels are used to treat the delicate skin of the backs of the hands). Generally, these medium chemical peels are required to achieve a significant result, but a series of more superficial chemical peels can help to achieve similar improvements. Recovery after photo rejuvenation or IPL of the hand skin is minimal and you should be able to return to work after treatment. Final results of photo rejuvenation or IPL of the hand skin will be seen at 6-8 weeks after the third treatment. Laser resurfacing is an ideal treatment for age spots and other pigmentation problems occurring on the hands. The laser can also help to thicken the skin of the hands as the heat promotes new collagen growth. There is minimal downtime, though some flaking of the skin may occur. Final results are apparent after three to six months. Dr. Wright uses the Lumenis ReSurFX laser to provide precise control as the procedure gently removes fine lines/ wrinkles and age spots to reveal smooth, fresher-looking hands. Because the laser’s microbeams only target a pin-dot size of skin tissue at a time, the untouched skin surrounding the treated skin protects the integrity of the epidermis and healing occurs quite quickly. There is negligible downtime (1-2 days of slight swelling) and no reason to miss work! Patients will experience about 2 hours of heat to the hands immediately after treatment and about 24 hours of redness. Because there is no actual peeling of skin, patients remark that the downtime is very minimal- which is very different to most of the machines available. With this negligible downtime (1-2 days of slight swelling), there is no reason to miss work! For Hand Rejuvenation, it has never been safe to perform ablative laser resurfacing on the hands due to the risks of scarring and skin color changes. But now, with the introduction of ResurFX non-ablative laser resurfacing, you don’t have to put up with the problem any longer! Skin MD and Beyond is able to offer skin rejuvenation techniques that are most commonly used on the hands to remove aging changes such as pigment, sun spots, age spots, rough dry or crepey skin, wrinkles and other aging changes from the aging skin on the hand. Hand skin goes through the normal process of skin aging, where the skin thins and becomes less elastic. The texture becomes dry, less smooth, with more fine lines and wrinkles appear. 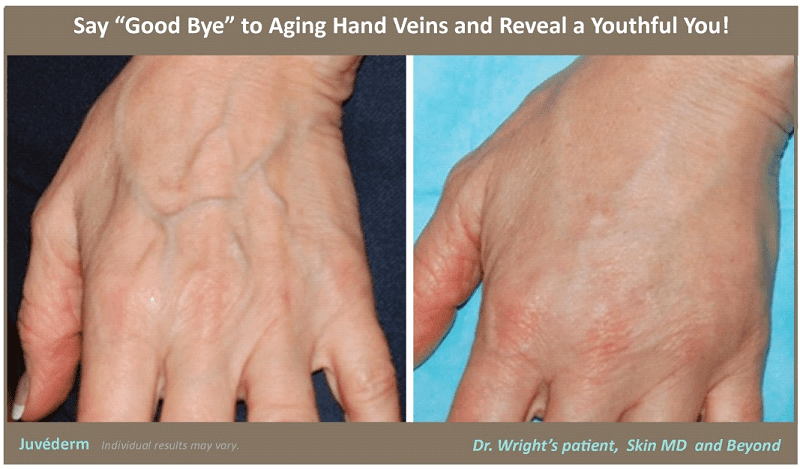 There is loss of subcutaneous tissue in the hands which causes the veins to become prominent, which is very aging. The hands also become very bony. At the 8th Anti-Aging Medicine World Congress, studies were shown that the Hyaluronan Filler, Juvéderm, appears to not only volumize the skin, but significantly increases the hydration levels of the skin setting a new standard for skin-rejuvenation therapy. Hyaluronan (HA) is a natural polysaccharide found in skin that has the property of retaining water, and this sponge-like effect is important in keeping the skin hydrated. Over time, the loss of HA results in older-looking skin that is characterized by fixed fine lines, wrinkles and folds. With aging, the skin tends to dry out because it gradually loses the natural hyaluronan that we have in our skin. As a result of that, our skin loses its elasticity, smoothness and brightness. But now, a very simple treatment to inject Juvéderm into the hands to act as a “Skin Booster” is an excellent way to treat crepey skin and fine lines not only because of their filling effect, but also because HA attracts water to it, resulting in fuller and smoother skin where injected. Dermal Fillers are the treatment of choice for reversing or correcting the prominent veins and hollow look or scrawny look caused by muscle wasting from disuse and fat loss beneath the skin with hand aging. To instantly refresh old looking hands with enlarged veins and a bony appearance, injectable fillers such as Juvéderm and Radiesse can add volume and plump up the skin on the back of your hands. The hyaluronic acid present in the Juvéderm attracts water and rehydrates the skin for a period of 10 to 12 months, and is best use for first time treatments or patients with thinner skin. Radiesse, a calcium hydroxyapatite filler, will also stimulate collagen and last the same duration. An added benefit is that new collagen formation is promoted for more long term beneficial effects. The amount required for hand filling is variable, it depends on the patient’s anatomy, and where the patient wants to get to in terms of results. Dr. Wright will assess your hands and decide on the best dose after taking a history and performing an examination. The treatment takes approximately 15 to 20 minutes and a local anesthetic is on hand to reduce any discomfort factor.